It is called the Sani Stagger due to its tough nature. Starting and finishing at the Premier Resort Sani Pass Golf Course, the Sani Stagger winds its way up to the top of Sani Pass through the Lesotho Border Post to the summit of the Pass making it truly an international race. What makes this out and back race so tough is that you start at an altitude of 1566m and climb to 2873m over 21km. That is a 1307m climb in 21km, in itself a daunting prospect. However, the “real” climbing starts around 11km into the race. At this point the runners have hit 1845m altitude. That means in the next 10km the ascent is 1033m. The race also does not run on the road, but is mostly jeep track. There is a cut off of 3:45 at half way and 6:30 to finish the race, with prizes only allocated to those who break 6 hours, the rest “run” away with medals. Despite of these challenging conditions, some 391 runners tackled the marathon route, 355 the half marathon, 82 the 38km trail race and 139 the 21km trail race in 2018 on 24 November. Now imagine running over this grueling course in 3:13.27? That is “all” it took for Comrades Marathon Champion Bongmusa Mthembu to cover the staggering race. Bongmusa has had an interesting few years. Growing up in Bulwer close to Pietermaritzburg as was a casual bricklayer. Bongs, as he is affectionately known shot to fame in 2014, when he won the Comrades Marathon. What should have heralded the start of an incredible running career was almost cut short with the passing of his fiancé in late 2014. He was “only” able to finish in 17th. In 2016 he was back on the podium, finishing third behind the record breaking run of David Gatebe. Less than 5 months later Bongmusa Mthembu would lead Team South Africa to a 100Km World Championship Team Gold Medal and an individual silver medal – in the process breaking the 17-year-old SA 100km record held by Bruce Fordyce. To cement his place as arguably the best Ultra Marathon runner in the world in this era, Bongmusa won the 2017 and 2018 Comrades Marathon, won individual bronze at the 2018 World 100km Championships and led Team South Africa to a silver medal. Bongmusa is already carving out a name for himself as a legend in Ultra running circles. With is Comrades Marathon win in 2017, Bongmusa became the first South Africa to win the race more than once since Bruce Fordyce in 1990. The 2018 win was another emotional race for Bongmusa. Close friend and training partner, Siphwe Ndlela passed away during a training camp in March. Bongmusa left his training camp in Lesotho to attend the memorial service of Ndlela. The loss and the huge pressure on him as race favourite made the 2018 win an emotional one for Bongmusa. 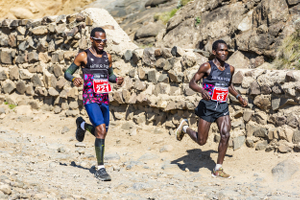 After his incredible run at the World 100km Championships in September this year, Bongmusa put his feet up for a bit before preparing for 2019 and the defense of his Comrades title. He got back to business by winning this year’s Sani Stagger, going one better than 2017 where he was second behind Nkosinathi Duma. This year the results were reversed, with Duma finishing in second. Is this the first warning shot across the bows of his rivals for 2019? Time will tell, but Bongmusa Mthembu is already a legend in the Ultra World and is a popular winner at Comrades.